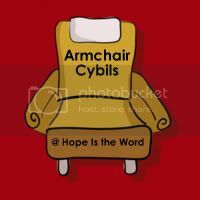 Armchair Cybils - I'm In! My friend, Amy, has gotten me even more hooked on great children's literature. I have always loved books, but Amy has gotten me thinking in a much more critical way about WHAT I read to my children and WHY. I've also been following the Cybil Awards (Children's and Young Adult Bloggers' Literacy Awards) through Amy's blog. You can see the books that have been nominated and make your own judgments about which books should win! I'm taking Amy's challenge to read some Cybil nominated books and then post about them from November-February. Then, we'll talk about the winners. This is a great chance for us to read some modern literature (we've already read a couple of the books and they are WONDERFUL!) and expand our horizons. I'm in for the Armchair Cybils -- are you? ?